Vallandry - The village and how to get there: This pretty village situated at 1600m provides a wide range of amenities within a tranquil setting. At the centre of the village is a pedestrianised area where most of the shops, bars and restaurants are located. Local stores include a supermarket, bakery, delicatessen, newsagents and several ski-equipment hire and outdoor clothing retailers. Local restaurants include a pizzeria, creperie as well as traditional Savoyarde and French cuisine. Other local amenities include cash-point facilities, post office, tourist information, cinema, pharmacy and local Doctor. Vallandry has excellent road and rail links. Low-cost airlines run services to Lyon, Geneva and Chambery. By road from Calais is via autoroute and dual-carriageway almost to the door, details of the route available. Eurostar and the TGV operate day and night time services to Bourg St. Maurice which is 25 minutes from the apartment. Summer Rentals: Changeover day is normally Saturday, but if you would like an alternative day please ask - we can be flexible to suit your requirements. Also - if you would like a short break - just ask! You may want to combine a break in the Alps with one elsewhere in France. So whatever your needs - we can be flexible, just let us know what you would like. Excellent Summer Location: Vallandry is located on the edge of the Vanoise National Park and provides access to numerous activities during the summer months such as hiking,mountain-biking, horse riding, white-water rafting and parapenting . The chairlift - approximately 300m from the apartment is open everyday from the beginning of July to the end of August. Once you arrive at the top of the chair-lift there is an abundance of marked routes and trails for both walkers and mountain-bikers, (bikes can be hired locally). There is a swimming pool (with fabulous mountain views) and an 18-hole golf course a twenty-minute walk away in Arc 1800. Kids love the Gli-Air aerial assault course in Nancroix. Parapenting, kayaking and white-water rafting can all be booked locally. The village also boasts two tennis courts, a beach volleyball pitch which also doubles as a football pitch! All-in-all there is more than enough to keep everybody amused both adults and kids - an excellent activity-filled summer location. There is on street parking available in front of the apartment. Both bedrooms have double wardrobes and additional drawer and cupboard space. Dual heating within the apartment – under-floor and individual thermostatically controlled room heaters. Apartment's individual ski locker located in the basement. There are video and dvd players available - plus some skiing videos to brush up on techniques! Board games, playing cards and a selection of novels are available for guests' use. Whilst not actually on the slopes (so not ski-in/ski-out) the location is impressive, being a short walk from lift and all facilities. First impressions on entering property are good and photos provided are a fair reflection of 'what to expect', although it was disappointing that the (bedroom) views of Mont Blanc are obscured by building machinery .... although I can't blame owners for this. It was also very good to find 'basics' like salt, pepper + numerous herbs as well as some (long life) items in food cupboard ~ presumably left by previous occupants. We were very lucky with weather & snow conditions and location of 'ski cave' was very convenient meaning it was not necessary to carry gear up stairs to apartment. Our only criticisms would be lack of Cable/Satellite (which I had thought was in details) and Wi-Fi although it was clear that there was none and our mobile phone contracts worked well. Three of us stayed the week but I'd be wary of staying with a (much) bigger group since there's only one toilet with no basin in that (separate) room. All things considered the plus points mean that I'd have no hesitation in recommending and we'd consider staying again in the future. Perfect January; perfect place to stay and ski. Well, what can we say; everything fell into place. The flights, the car hire, and then to the apartment in Vallandry. 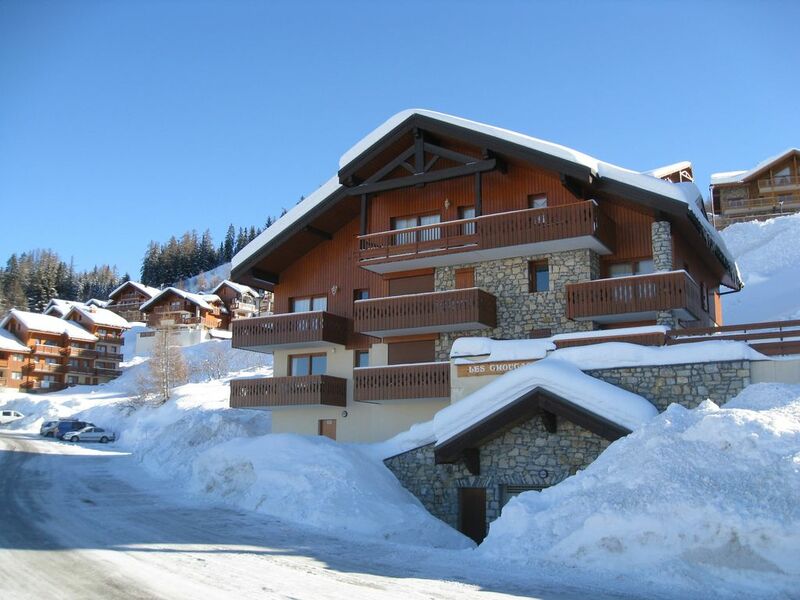 Clean, spacious, well appointed, big balcony and easy access to to the village and the skiing. This was a family holiday, the 4 of us included to "boys" 19 and 21 year old. They loved the resort, and the apartment was big enough for us all. All the joining instructions worked out well; we recieved the keys in good time. The lads appreciated the DVD selection. Would I go back to the resort...absolutly! Nice and quiet, but with enough facilities for the week; 10 min walk to Plan Peissey for more restaurants and shops. A short walk in the morning to the first lift. Would i go back to the same apartment... yes I would. it was exactly as stated, and served our purposes. A good sized place, well looked after, in a great location. Nous avons passé une agréable semaine dans une jolie station. L'appartement est très agréable, proche des commerces et des pistes. Il est très focntionnel et bien équipé. This was our fourth year in Vallandry and our third stay in this homely, comfortable apartment. It has lovely views and is a great base for winter or summer. Walking distance from the village and the first lift for skiing. Great especially when you have tired, grumpy children. We've stayed in French-owned apartments before, but find them very impersonal. The extra shower was very useful and the bath an added luxury. The kitchen was really well-equipped, including things that are peculiar to English homes. You can make snacks and have dinner inthe village or simply make things from scratch. The local Sherpa shop is good. The deli also sells the nicest rotisserie chickens and potatoes I've ever tasted. You need to order them in the morning or day before. Can't recommend it enough. The skiing is also great! Have booked for next year! Other Activities: white-water rafting, canoeing, kayaking, parapenting. Ski: Vallandry offers fast access via a quad chair into the 200kms of marked runs within the Les Arcs ski area. This high altitude, north-west facing resort provides skiers with enormous variety from the tree-lined runs down to Vallandry and Plan Peisey to the 'longest run in Europe' some 7kms long from the top of the Aguille rouge down to Villaroger. Off-piste skiing is varied and excellent. Snowboarders will enjoy the snow-park at Arc 1800 and also the floodlit half-pipe at Arc 2000. Resort rating is excellent for all abilities - with 13 Green (beginner), 54 Blue (intermediate), 39 Red (advanced) and 17 Black (expert) runs. At the end of the day your home run is a choice between green, blue, red or black depending on your level of tiredness! Ski school operate within the village and there is a children's club which caters for 4-12 year olds. Vallandry is also well situated for visiting other ski areas such as La Plagne, Saint Foy, Val d'Isere, Courchevel and La Rosiere. A security deposit of €350 is payable with the rental balance which will be repaid if there are no breakages and/or damage and once the keys have been returned. The apartment has 4 double beds - 1 standard double + 3 kingsize. There are 4 duvets and 8 pillows available in the apartment - you will need to take or hire sheets, duvet covers and pillowcases (square). Minimum of 3 nights can be booked (out of ski season) at pro-rata rate for week.